Demos included with Chimera can be started from the Tools... Demos menu. A demo source file contains the instructions to Chimera for running a demo. A demo source file and any associated data files together contain all of the demo information. Simply opening the demo source file in Chimera will start the demo. Any data files opened by the demo should be in the same directory as the source file, unless the source file specifies otherwise. The demo source file type can be designated by the suffix .src (part of the filename) or the prefix demo: (not part of the filename). The Demo Editor is a graphical interface for creating demo source files. After Chimera commands and other demo information such as title and explanatory text have been entered into the editor, the resulting demo can be saved as a source file in XML format. An older (2004), non-XML source file format is also supported for the purposes of running a demo. A Chimera demo can be started by opening a demo source file or a Chimera web data file that has a demo embedded. Demos included with Chimera can be started from the Tools... Demos menu. The models in the demo can be moved as desired; changes in position and scale are automatically corrected for by the demo mechanism. In addition, a linked URL will be shown in a balloon when the cursor is hovered over the link text. Save Demo As... bring up a dialog for saving the source file of the current demo. Unless a separate location was specified by the demo creator, any associated data files will be saved in the same directory as the source file. The Demo Editor is a graphical interface for creating demo source files. After Chimera commands and other demo information such as title and explanatory text have been entered into the editor, the resulting demo can be saved as a source file in XML format. A demo can be created from scratch or by modifying an existing source file. There are several ways to start the Demo Editor, including by choosing Tools... Demos... Demo Editor from the menu. This brings up the editor in an empty state. To have it show the contents of an existing demo, start running that demo and then choose File... Open in Editor from the demo dialog menu. The Panels section of the Demo Editor lists the panels in the demo. Clicking the name of a panel makes it the current panel: its name is highlighted and its information shown in the the Demo Editor. New adds a new panel below the current panel, if any (otherwise at the bottom of the list). Delete deletes the current panel. The up and down arrow buttons move the current panel up and down in the list. The order in the list is the order in which the panels will be shown when the demo is run. Only single quote marks should be used within a command or statement, to avoid confusion with the double quote marks enclosing the command or statement. Activating the Preview checkbox will show the text with any HTML-type tags interpreted. If there are no tags, the text will look exactly the same. Panel commands (optional) - commands for a given panel (see rules and tips). The plus (+) and minus (–) sign buttons add and delete entry fields for commands. If the cursor is in a particular panel command field, + will add another field below that field and – will delete that field. If the cursor is not in a panel command field, + will add a field at the bottom of the list and – will delete the field at the bottom of the list. The checkbox next to each field controls whether its contents will be executed when the panel is played. If the checkbox is deactivated, the information will still be present (if the demo is saved, for example) but the contents will not be executed. Execute runs the panel commands with active checkboxes. Undo commands (optional) - commands that undo the panel commands (see rules and tips). The plus (+) and minus (–) sign buttons add and delete entry fields for commands. If the cursor is in a particular undo command field, + will add another field below that field and – will delete that field. If the cursor is not in an undo command field, + will add a field at the bottom of the list and – will delete the field at the bottom of the list. If undo commands are present, the demo dialog Back button will be enabled for the panel. The first panel is an exception (the Back button will not be enabled), but in that case, Close can be used to close the demo. The checkbox next to each field controls whether its contents will be executed when the panel's Back button is used. If the checkbox is deactivated, the information will still be present (if the demo is saved, for example) but the contents will not be executed. Execute runs the undo commands with active checkboxes, but unlike the demo Back button, does not regenerate the position due to the commands of the previous panel. Chimera demos include a built-in mechanism for resetting positions to correct for any manipulations by the user. Clicking Next regenerates the position directly due to the commands of the current panel (in case the user had subsequently moved anything) before executing the commands of the following one. Clicking Back executes any undo commands and then regenerates the position due to the commands of the previous panel. The demo developer is responsible for determining which commands are needed to undo all operations other than positioning/scaling. If the commands for the panel only change positioning and/or scaling, an empty entry in the Undo commands section can be used to enable the Back button. Data directory (optional) - where to look for data files opened by the demo; it is usually best to leave this blank and place any data files in the same directory as the demo source file. Image (optional) - a file containing an image to be shown on the demo dialog; possible formats are bitmap (*.bmp), GIF (*.gif), JPEG (*.jpg), PNG (*.png), and TIFF (*.tif). The unscaled image will be placed in the upper left; dimensions of roughly 100 by 100-250 pixels (width by height) are recommended. If no image is specified, the dialog will show the Chimera logo on a black background. Image background color (a color well, No Color by default) - the color used to fill in the left side of the demo dialog under the specified image. The width of the rectangle of color will match the width of the image. If an image is specified but the background color is not, a light gray will be used (the same color as the rest of the demo dialog). 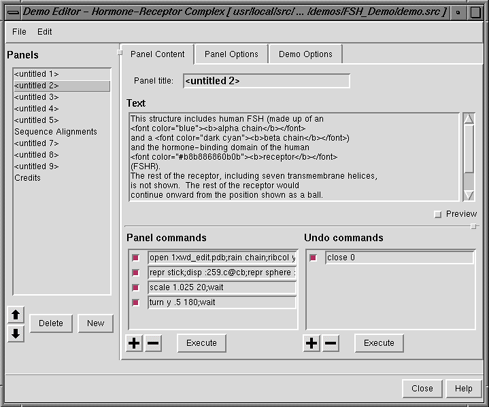 If no image is specified, the dialog will show the Chimera logo on a black background. For a demo to be listed in the Tools... Demos menu, there must be a corresponding directory under share/Demo/demos/. The directory should include the demo's source file (named demo.src) and any associated data files. For example, the file share/Demo/demos/COX_Demo/demo.src contains the instructions for the demo that is started by choosing Tools... Demos... Cyclooxygenase Demo from the menu. The name that appears in the menu is set within the file share/Demo/ChimeraExtension.py.